BleachBit is a long standing free alternative to CCleaner and other commercial system cleaners. The open source program was updated to version 2.2 recently. That, and the fact that some people don't like the direction that CCleaner development has taken since the Avast acquisition of Piriform, justifies another look at the program. First the basics: we followed BleachBit's development ever since our first two reviews here on Ghacks in 2010. Jack Wallen reviewed BleachBit for Linux, and I took a look at the Windows version of the application in the same year. The developer released BleachBit 2.0 in 2018, the last major update of the software application. BleachBit is a system cleaner that supports Winapp2.ini files to improve its cleaning, and also CCEnhancer which does the same thing basically. You can download a portable version or installer from the BleachBit website to get started. The application itself is easy to use but requires some level of expertise when it comes to the choices that it presents to you. BleachBit displays the available clean locations sorted into groups for easier access. Each has a checkmark associated with it to either check individual items or entire groups. BleachBit displays descriptions for each item when you select it. While it does not provide a detailed description or information, it should give a rough understanding. A click on preview starts a dry run that scans all selected areas without making any changes to the application. The process adds information to the size column so that you know how much space you will free up when you run the clean operation. The log on the right side of the interface displays all items that will get deleted or cleaned when you run the clean-up operation. BleachBit supports other options: you can add custom locations to clean, add folders to the whitelist, or shred files or free space to remove traces. Additional programs to clean added, e.g. Waterfox, SmartFTP or aMule. Cleaning improvements for Chrome, Firefox, and Chromium. Support for Opera based on Chromium. New --wipe-free-space command line option to remove traces from unused disk space. Option to shred paths from Clipboard. I like BleachBit: it is portable, open source, and does not nag you or try to sell you upgrades to professional versions. The program needs an interface update in my opinion to take it closer to CCleaner and make it more attractive to users who prefer that. Now You: Which cleaner program, if any, do you use? A look at BleachBit 2.2, a new version of the popular temporary file cleaner for Windows, Linux, and other operating systems. And it is a surprise to me actually, using it on redstone 5 next with a commercial one TraxEx from another german company. But maybe I will save the money for the next license. I’ve used BleachBit on Linux and it does a good Job, but there a better alternatives on Windows. The UI does not appeal to me, although it looks better on Linux. So Cleanmgr+ is currently my first choice. 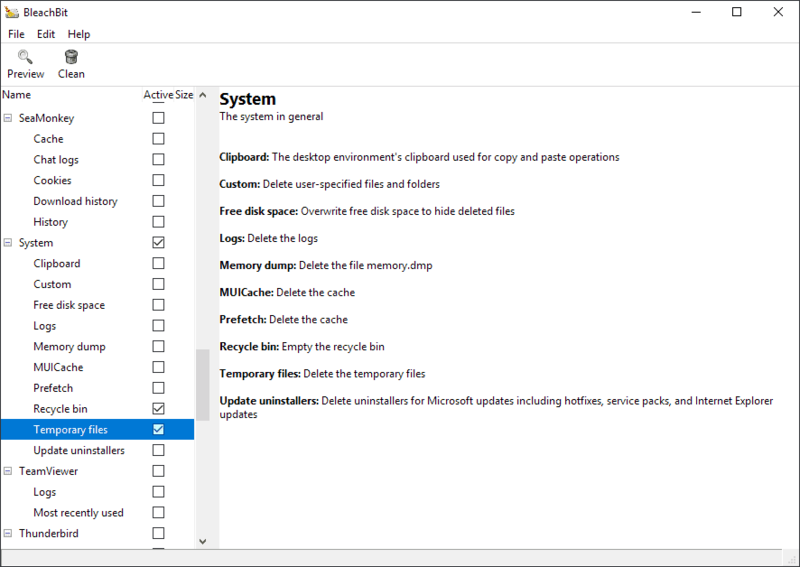 it would seem like the Cleanmgr+ was designed for Windows 10 to replace some deprecated feature and only so happened to be expanded upon with lots of new features. I have Windows 7 and I actually started using it despite the fact that some cleaning rules are uselss to me. It cleaned some good couple of Gigabytes off my C:\ drive the first time I ran it with all options enabled, something that no other cleaner did for all the years I’ve been testing them. It’s definitely a good tool to have on the side, but it seems like it’s only doing some actual cleaning after a month of no cleaning, other than that it just sweeps small scraps. Interesting, so it seems like a modern copy of my beloved cleanmgr.exe that’s all I need. Can you select what cookies to keep, like you can with CCleaner? No that is not an option. That was one of my preferred features in CCleaner. Now that you mention it, does any software allow that ? Does any browser have that feature, for that matter ? I have just given a try to PrivaZer. I’ll probably uninstall it. – Very helpful interface. You get hand-holding at every step. – Seems to clean deeper than others. – A portable version is available. – Logs can be read while cleaning runs. – Priority can be changed while cleaning runs (although it did not seem to do anything on my machine). – Free, or you donate what you wish. – The “portable” version creates 208 registry keys, unannounced. – Extremely quirky and non-standard interface, and did I mention ugly and difficult to read, with light grey text on white ? That’s for graphic design as well as workflow. – I tried to do some light cleaning for testing. Securely erasing free space on my external backup drive failed, without an explanation. It left a new 100 GB working file of its own on the disk, that I had to delete manually. I immediately re-imaged my PC after that. That program does not give me a feeling of security. It has a sort of wild West sniff to it that’s unsettling for such operations. Many claimed portable programs write to registry. The definition https://en.wikipedia.org/wiki/Portable_application says “designed to read and write its configuration settings into an accessible folder in the computer, usually the folder where the portable application can be found”. The use of ‘usually’ in the definition means Registry is not excluded. No requirement to install would be the major factor (i.e. you can put a portable program on a thumb-drive and use it on any OS-compatible machine without installation). ‘Quirky’ is one way of describing it. For most, I think ‘highly confusing’ may be a lot closer. 100gb? I’m sure it wrote nothing like that when tested on my machine with only 39 gb free space. Interesting… Maybe I’ll start to audit systematically non-installations of portable programs with Revo Uninstaller, just in case… That’s how I know about PrivaZer’s 208 registry keys. However, the Wikipedia definition is wrong, and you’re stretching it even further. First reason to use portable programs rather than installable ones (at least when running them from the internal disk) is precisely not to have them spill their beans in the registry ! The registry cannot be considered as a folder on the computer. And a portable program is one that only writes in its “installation” folder. Not in AppData, for instance, as a certain number of them do. I don’t use portable programs for portability, but if one does, how is writing to the registry, or even to AppData, compatible with it ? You say the Wikipedia definition is wrong. I believe the Wikepedia definition to be the general consensus. Either way, I don’t care. For my use, if it runs without requiring installation and can be moved to another machine on a thumb drive, that’s close enough for me. People are different and use portable programs for different reasons. Some like to have access via a thumb drive. I have my own reasons. You want programs that don’t write to Registry. That’s fine but you have your work cut out if you want something that leaves no traces in Registry. Instead of monitoring, try opening Regedit and search (but don’t change anything unless you know what you are doing) . For me it was easy. My portable apps are in a data drive so I only need to search for the top level path, ‘F:\Portable\’. However, that won’t find every entry. It’s just a starting point. – Adding to right-click, will create entries. – If you create file associations these are added to Registry. – Some add settings in the Software section. It didn’t take too long to find Anti Twin, Patch My PC. Spybot Anti Beacon in HKLM Software. There are likely to be other entries, as well. I am far from expert in forensic examination of Windows Registry. Thank you for the tips. Foraging in the registry to “uninstall” a “portable” program, though… It’s better to use the installed version, which comes with its uninstaller. Theoretically at least, this should take care of registry changes. Rant : software publishers almost never make clear what the difference is between their portable and installable versions. And in particular, what features, if any, are missing from the portable version. If a so-called “portable” version writes anything outside of its own “installation” folder, of course it should be stated in so many words. Such programs are called “semi-portable” in my own notes. Not portable. Installed versions of programs also leave a lot behind when uninstalled (gets back to the reason people use Bleachbit). Even if you use Revo Uninstaller or Geek Uninstaller the clean up with something like Bleachbit, traces may be left. In some cases that may be due due to sloppy programming. In other cases, bits and pieces are deliberately left deliberately in case you install again or, if you tested a trial version program, to retain information that you tried the free version for so many days. The easy way is not to worry. Registry is an indexed database. The fact that contains redundant information, settings, etc is harmless and does not affect performance. The circumstance where leftover traces may be harmless is when people break the law and their computer is seized as evidence. Fortunately, that doesn’t apply to most of us. That’s an often-made claim, and one I’m willing to believe. However, it strikes me as a straw-man argument. My fear about adding to the registry is not about speed : it’s about introducing incompatibilities and an unstable condition. Also, if a bulging registry is harmless, what causes Windows rot ? The unescapable condition that mandates reinstallation after a few years, because of slowness and abnormal behaviour ? If I knew the answer to that, I would be the best paid programmers at Microsoft! SIMPLE LOGIC: If a Registry Cleaner was necessary, wouldn’t Microsoft to include one in Windows? Nothing I ever read indicates a large registry causes Windows problems. Years ago, that was not the case. We now have a hangover of Registry repairers and compactors. All of the writers have a vested interest in us believing their tool remains necessary. Hence, there is a lot of misinformation about. Something or someone writing a bad setting to Registry is not a problem with Registry or the way it functions. It is a problem with a setting. Restore a Registry backup; Uninstall a bad update; System Restore; Windows backup restored are methods to get around those problems. So is web-searching to find solutions but that often means a large investment in time and learning. I agree about not using registry cleaners, although for a long time, I used C-Cleaner’s, with no obvious negative effects. However, that’s a separate issue from being reluctant to write too many things in the registry, because it might be detrimental. We know the cause of Aids, we know how not to catch the disease, and yet we don’t have a cure for it. If we applied the equivalent of a registry cleaner to it (say, drink a glass of sulfuric acid every morning) that might create more trouble. Oh ! no. There are hundreds of additions that are necessary to Windows, and Microsoft never included them. As for backups and System Restore, this never works. It would, if you broke something definite at a definite moment. But that’s very rarely the case. Things get sort of slower and sort of broken over time, and reverting back to an older state is bound to undo needed changes. Portable-wise, how is it possible to have a program which can be ported from one computer to another, on a flash drive, and have it write things in the registry, or AppData ? You’re more than welcome to your daily glass of Sulphuric acid😲 I’ll stick with the things now done. It is not clear what you want or and why but your “hundreds of additions that are necessary to Windows” may be a reason for your problems. I use some, not hundreds. None of them are necessary. Windows would function fine without them. One you may not be doing that would slow your system is pruning autorun (start-up) entries. Another thing is switch off unnecessary Services. In particular with Services, you need to understand what it is you are switching off. Some have unhelpful names and limited descriptions. Services are ‘leave alone’ territory for most users. Mark Russinovich’s Autoruns (https://docs.microsoft.com/en-us/sysinternals/downloads/autoruns) can help get rid of some of the background load. You need to right-click and run as administrator to get full benefit. HINT Autoruns includes a menu option to submit entries to VirusTotal, which may prove useful. if you use it, use it wisely (e.g. don’t switch off your regular anti-virus software but if you have a secondary scanner that you only use occasionally, switch that off). Portable apps are easy to run from USB whether or not they write to Registy. Installed programs write to Registry. Some (not all) portable apps write to Registry. Not all installed apps remove all Registry entries when they are uninstalled (uninstaller utilities can ferret out some of the remainder). Portable apps that write to Registry definitely do not delete Registry traces when you delete the folder to ‘uninstall’. I’m not sure whether an uninstaller utility would clean up some of the left-overs from these. I use Everything to find data folder left-overs (both installed programs and portable apps) before judicious deletion (anything else on the PC that may access these data). The amount of data written to Registry by many applications is relatively small compared to the overall size of Registry. Realistically, ferreting out these traces and deleting them won’t save a lot of Registry space. Registry growing in size is not going to be a significant impact on performance, especially on a high-spec machine (I don’t know of any tests but gained the information via reading – admit bias towards Micrososft MVP information compared to 3rd party software vendors). I’m not sure whether Martin recommended this back in history but Mirinsoft has a program that will back up some installed program settings. http://www.mirinsoft.com/ms-apps/cloneapp I have not tried it yet but plan to test it on a new laptop next week. I’ve said more than enough. Anything else you need, try a web search. Nothing is necessary. Using a computer is not necessary. It’s very clear what I want, and it’s the same thing as everybody : a fast, efficient computer doing what I need it to. What you use is not what others need. Saying “I use this” is not an argument. That line of reasoning reminds me the Firefox fanboys double-bind “argument” : stop complaining Firefox cannot do what you want : there’s an extension for that. Oh, now you complain that Firefox is slow / unstable / crashes ? Well, that’s your fault, because you put bad extensions into it, and anyway you have too many. BleachBit is a very good cross platform system cleaner imho. The program’s ‘about’ says 2.2, without mention of a beta version. Gerard: FYI All even-numbered releases such as 2.0 and 2.2 are stable, and odd such as 2.1 and 2.3 are beta. What, if anything, is so vital to clean that you need to run these cleaners? I think it is a mix of “I have always used a cleaner program”, “it is convenient”, and there is some sort of satisfaction involved when you free up disk space. I don’t use cleaners on my system, but I can see that they are useful to some. Thanks for answering this, Martin. I had precisely the same question! Non solicited log data and other similar information that lingers around… it is like sweeping dust. For some, it’s connected with spying. Telemetry and other methods of tracking what you do are generally associated with tossing advertisements your way. In principal, this (plus advertising) drives many people crazy. Personally, SSD space is incredibly tight. I need to get rid of the accumulation of unnecessary rubbish occasionally or the HDD approaches capacity. Cleaning up with DISM last year I recovered well in excess of 20gb. Most of that was from C:\Windows\winsxs, which is an area not to be fiddled with manually (and is not tackled by most cleaner utilities). I still feel such programs are like a comfort blanket and probably not needed for most. I’ve still to hear a compelling reason. Genuinely curious here. @Benjamin, Sweeping dust. How long before that dust actually makes any difference? You’re running something to delete a few kb at most. How many programs really create unsolicited logs worth worrying about? Can you give any examples of any that really would make a difference? @Steve, Deleting telemetry after the fact is pointless. Winsxs can be cleaned by the standard diskcleanup. What data causes the ‘accumulation of unnecessary rubbish’? Again, I’m actually genuinely curious why people use these. Replies are often so woolly. Since cleaning talk makes you feel dirty, I have just used Windows 7 own tools to delete unneeded files on my disks. It wiped 18 GB of data, 10 of which were Windows error logs. As for why cleaning programs are needed : I need them to securely erase traces of activity which would harm my privacy. I wasn’t talking personally about Telemetry (but do have an example). I was talking about Telemetry as defined (which is not restricted to Windows). One Free AV program tested worked fine on my low-spec machine and would still be there had I not found something that alarmed me. It was writing a log it called a firewall log despite the firewall component not being on. No doubt the manufacturer was using Telemetry to gather whatever they were recording in the log (I can’t recall the size – maybe 1gb or more when deleted the first time). It was not in its own program folder nor any of the normal data directories but was below Windows32 and hidden. There were no log settings in the program itself to enable switching it off. After deletion, the program simply wrote a new one and started appending records. The manufacturer’s response did not satisfactorily explain why a Firewall log was being written when firewall component of the program was off nor did they tell me how to prevent it or what the purpose was. They were very evasive. So, uninstall and onto testing the next AV. No, you can’t stop Telemetry by deleting it but you can delete files related to Telemetry. The reason for the accumulation is simple Windows and many other programs are incredibly untidy and rarely tidy up after themselves. Winapp2.ini enables cleaning of more that just Microsoft’s offering. Overall, the modern system is far less tidy that before Registry was introduced when programs had their own folders and kept all their files within it (apart from those you saved elsewhere). Uninstalling then was simply a case of deleting a folder. The Windows directly did not become the bloated mess. Accumulations of unnecessary files over 20Gb are ridiculous. Then there is often accumulation left behind in ProgramData and UserData when you uninstall a program. Nobody should live like that whether it bothers them or not. I found that when updating BleachBit on three machines, after starting BleachBit on each machine it said there was an update available: BleachBit 2.0. I disabled the check for update settings as this is obviously a bug. Uninstalled CCleaner for phoning home etc, installed BleechBit, did not like it, installed CCleaner Portable which is not phoning home, happy. Yes it does! WFC currently shows me 11 attempts to 7 different IPs. What is the most recent version which does NOT phone home? … or you could implement a Firewall block. seeprime: the update notification should now be fixed, as the release process is complete. Just disk cleanup that comes with the operating system. And occasionally manually clean out Firefox and Chromium. Virus inside the latest bleachbit! If you make such a claim, provide evidence. Which program detected the virus, what is it called? Only one of the more than 60 antivirus engines of Virustotal detected something (potentially unwanted application, not a virus). Apparently, Bleachbit made a number of code changes that have caused numerous false positive with some antivirus software. BleachBit uses UPX to compress its executables. Even though it’s easy for antivirus software to decompress UPX, it triggers their heuristics, causing a false positive. Yes and Cylance is one of the vendors that seems to regularly cry Wolf. Possibly it was an early release or someone had heuristics tweaked to the max? I heard that it is not safe to use on Ubuntu or Linux distro in general. Is that true? It is a very powerful tool and it doesn’t tell you which options might destroy your system. Use it only if you really understand what you are doing. I tried Bleach-Bit. When I attempted to clean, I would get a nag screen reminding me, that I wasn’t connected to the internet. Why would it do that? Was the BB program calling home with my cleanings? Bleach-Bit, by default, calls out to see if there are updates to itself available. You can turn that checking off by going into Edit/Preferences. It’s the first option there, IIRC. Chromium -> DOM Storage has a change in 2.2 from this Linux distro. Other extensions that use this for their settings, such as ScriptSafe now get obliterated. Suppose this is good in some fashion but unexpected… and definitely a change in behavior. I always used batch files in Windows and bash in Linux to do similar things. I would recommend this over Ccleaner in a heart beat though.